The Nets are moving! The Nets are moving! Immediately! Well, not immediately, and not yet to where you think — but the terms have finally been reached: The Nets are Newark-bound. They're very excited about it. "Ultimately, we're going to be moving to Brooklyn, so that would just be a temporary thing to play in Newark," Nets guard Keyon Dooling said after practice yesterday. 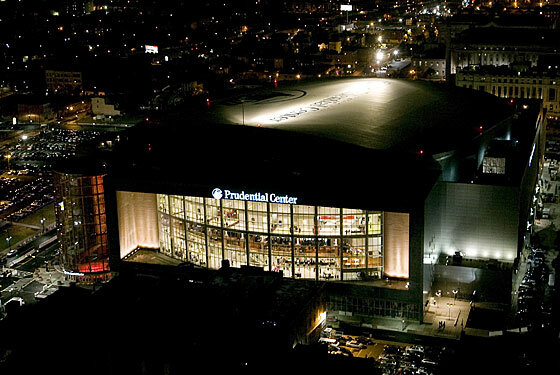 "But the building in Newark is very nice and it's more NBA-suitable (than the Meadowlands). This is more about the building itself. The facility is nicer in Newark." Many believe that playing in Newark will help them potentially lure free agents this off-season. You heard that correctly: The general consensus is that the Nets will be able to use their home as a selling point, and that home will be Newark. And they're right. If you haven't been to the Prudential Center, it's much, much nicer than you realize it is, and it's a quick little five-minute walk from the PATH train. It's even kind of safe! Plus, unlike the Meadowlands, there are actually places within walking distance of the arena where you can buy a beer pre- or postgame. They're safe, too. Swear. This just made it about 3 percent more likely that you will go to a Nets game over the next two seasons — unless, of course, you're still a little mad about that impending eminent-domain thing. By the way, if we were a resident of East Rutherford, all logic aside, we'd be a little depressed that someone — a team, a citizen, a pet, anything — was so damned excited to relocate to Newark. That can't be good for real estate.